The Voice • Run Hard. Rest Well. The Voice is a popular American TV show with quite a following these days. Does He have a following today? Two thousand years ago there were a handful of people who had ears to hear. Mary heard the voice of God. Zechariah heard Him in the quiet of the Holy of Holies. Then there are the shepherds. They heard the voice, then the voices of the angels. The wise men also heard from the Lord, right after their visit with King Herod. Joseph got a second shot … right before their midnight escape to Egypt! Most surprising of all, perhaps, was the cry of the newborn babe. Sleepy Bethlehem was bustling with the arrival of travelers from near and far. It would have required a measure of stillness and being in the right place at the right time. 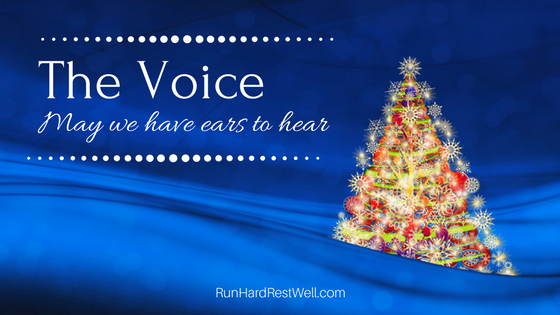 This Christmas, have you heard Jesus’ voice? Unlike the first Christmas, it doesn’t require being at the right place at the right time. It does require a measure of stillness. In your circle of friends and family, the voice of God may or may not be popular, but Jesus still has a following. How has Jesus gotten your attention this month? May your journey to Bethlehem be marked with Wonder, Peace, and Joy. Together — we will listen well! Praying there is “Peace and Quiet” waiting for you around each bend this Christmas and into 2018. A beautiful reminder! Thanks so much, Brenda. Everything about our culture propels us into Christmas chaos and craziness. We all need them and are blessed by them. May we enter into Christmas Quiet. I am so disappointed. And of course, the problem begins with me as well as with anyone else. I haven’t been in the stores to hear if Christmas music is playing….in fact I haven’t been anywhere, but growing up and in raising my family, after Thanksgiving, we had a marathon of carols playing, tree trimming, and laughter. I wonder when we lost the laughter and joy. We didn’t do a lot of outside decorations, like some neighborhoods did, but every year we’d pile the kids in the car and see the lights. This year, no carols have been playing. Hallmark Christmas movies have been on. I don’t think that counts, and decorations are still left unfinished. If we are too busy for worldly celebrations, I wonder what it says for our hearts with God. Yes, I will be listening for THE VOICE. It’s the only thing that matters and I will rejoice in Christ, my Lord, my Savior, and my God.